What is a Drop Down list? You can see that when you click on the drop down arrow to the right of the cell a list of options appear. If you click on anyone of those options that value is entered into the cell. How do you create a drop down list in Excel? To create a drop down list in Excel you'll have to use Data Validation. Data validation is the term used when ensuring erroneous data is not entered into the cells. In other words, ensuring that the data is valid. 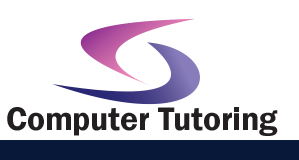 To create a drop down menu you will first need to create a list of items to be entered. Enter the following on a blank spreadsheet. 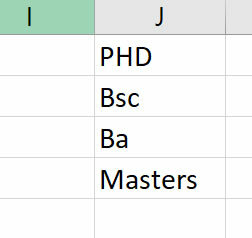 Note that I have entered the values in the J column. In fact cell reference J1. Now to the left of the sheet, in cell A1 enter the text Courses. 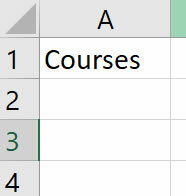 Highlight cells A2 to A10.These cells we want to become drop down lists. Click on the Data Tab then on the Data Validation button. From the Allow drop down menu choose list. 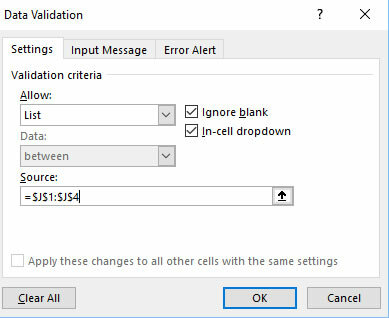 Click in the source box and then select cells J1 to J4. These are the cells that contain the values in your drop down list. Now enjoy your drop down lists. 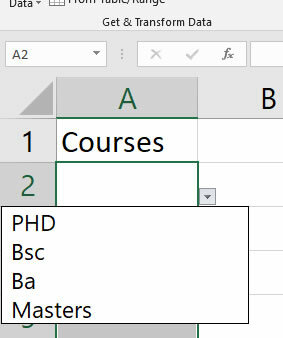 Creating a drop down list in Excel is important should you want to make sure that your data is accurate. Using Drop Down lists as part of validation makes it less likely someone will accidentally enter an incorrect figure. However, it's not a full proof method.